The first time I realized that Mongolian customs regarding death and funerals are different than American ones, I was caught unaware. There I was, sitting in my school’s teachers’ room when I was handed a bag. To my delight, it had little presents in it: a box of matches, bottle of milk, wipes, and candy. Wow, quite exciting considering my minimal Peace Corps income! I turned to my counterpart and asked why I received this goody bag. She said, “one of the worker’s family members died”. Gulp, guess I shouldn’t have been excited… Since then, I have unfortunately received at least 5 more funeral “goody bags” and have been increasingly interested in Mongolian funeral rituals. 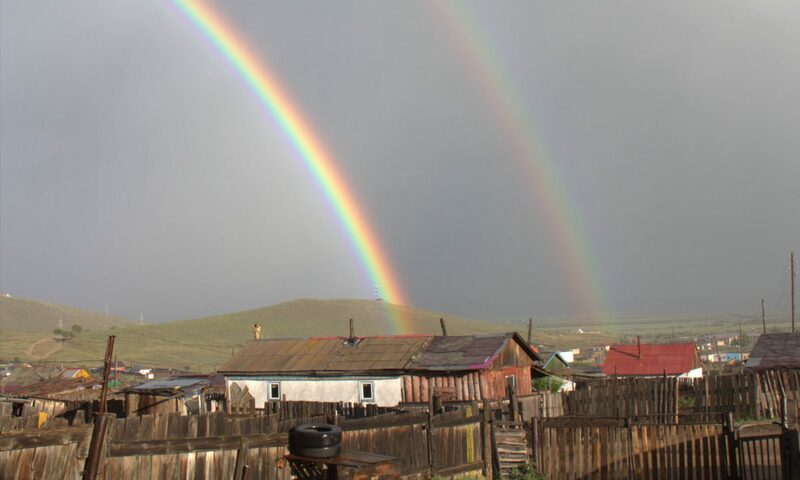 I had planned to ask my closest counterpart about the ins and outs of Mongolian funerals, but unfortunately, she was continually dealing with sick family members or family members who passed away. Last week though, on a run with a community counterpart, I had the opportunity to ask her. She was a wealth of information and started asking about funerals in the US. Most of the information she knew about US funerals was from movies, and when we delved into the topic, she was just as interested and confused by our traditional customs. Definitely a win for cultural exchange! I also had the chance to ask her husband, a red sect Buddhist monk, some questions. Anyway, here is what they shared with me. When a Mongolian person passes away, the first step is to have a monk visit the body. According to my friend’s husband, a monk, “in Mongolian Buddhism people know when they will die, so they want to hear the sutra and the bell while they’re dying”. This helps the person navigate the world in between this world and their next life. If the monk is not there at the time of death, the monk comes as soon as possible after the person has passed away. Monks read the “golden box” first. This is the horoscope of death that explains what the person was thinking and feeling when they passed away. However, only some monks do this (the powerful monks). The horoscope also shows which day the funeral will be, which day they should find the land, why the person passed away, what the family needs to do, what the deceased’s thoughts were, and what the person will be in their next lifetime. The “golden box” helps the person be reborn quickly and have a nice new life because the soul will travel the right path and won’t get lost. Another duty of the monk is to organize the funeral correctly. After reading the “golden box”, the monk will go out into the countryside to pick a place for the funeral that is fitting for the deceased. A couple days later, the funeral will occur. The monk says when the burial will happen, and in the meantime, friends and colleagues of the deceased visit the deceased’s home where they are fed. At this time, they give donations for the funeral. Including the deceased, an even number of attendees will be at the funeral, presided over by the monk. After the funeral, an odd number of people leave. The deceased is left at the funeral site. During the funeral, the monk reads sutras to help clear the passage for the soul, while funeral attendees stand in a circle. There are three types of “burials”. The currently popular style is a burial similar to that in the US. The body of the deceased is buried approximately 2.5 meters below the surface, and a headstone is placed on the site. While it is uncommon to see cemeteries here (many PCVs have commented on this since you can hardly drive two blocks in the US without seeing a cemetery), they do exist, just deep in the vast countryside. The second type is cremation and is not as common as a burial. Finally, the last type is typically requested in advance by older traditional Mongolians. This “burial” is perhaps the most peculiar for foreigners. The body is left at the site, above ground, usually on a mountain to be left to the natural elements. It is considered good if birds eat the body. If the body is not eaten by birds or other animals, the interpretation is that the person who inhabited the body was evil. After the funeral and burial, the “goody bags” are given to people who gave donations. The bags help the deceased’s soul pass by demonstrating appreciation to the donors. The mourning period for the remaining family lasts for 49 days after the family member has passed away. During this time, the family members may not drink, attend parties, or celebrate holidays in respect of the deceased. When mourners visit the family, they are given food and milk tea. Mourners typically bring a donation and шар тос “shar tos”, the fat/oil that is burned during Buddhist ceremonies. There is a shrine set up for the deceased with their picture, other personal mementos, and burning “shar tos”. The burning oil helps the spirit pass over peacefully. Family members, at their desire, will use prayer beads (108 beads on a loop called эрхи “erkhi” in Mongolian) and chant “ум мани бадмэ хум”. Some shrines have a small speaker box that continuously repeats this same chant. Once a day, usually in the evening, the family and mourners from that day will gather and chant. This can continue for as long as the relatives want. This helps the soul go up to heaven. Also during the 49 days, monks help the person find their next life by praying and reading the sutras for the person (the experienced monks do this). By the end of 49 days, the person will find their next life.